Christian involvement in the public square these days is predictable—not because the increasingly secular society knows its Bible, but because it knows which secular “powers that be” each side of the Christian divide answers to. Until Christians put their theology first, their activism will be little more rationally motivated than that of Hare Krishnas passing out flowers in airports. We will be moved along, one issue at a time, by charismatic and energetic talk-show hosts, politicians, and religious leaders, and our internal contradictions (such as calling ourselves “pro-life" when in truth we rarely speak up for the poor and oppressed after they’re born) will not win for evangelicalism respect in the eyes of the world even for having the courage of its convictions. What convictions? Activism, agendas, ideology: In the sixties, these were left-wing and called the “social gospel”; in the nineties they are right-wing and called “discipleship.” Activism, agendas, and practical involvement mean nothing without convictions, and convictions come from deeply held beliefs about God and ourselves. And that is theology. I’ve been quit busy and otherwise occupied over the past couple of weeks, and it doesn’t seem to be looking any better any time too soon. I’ve been busy with several gigs and have many coming up, and the yard work is WAY behind (the weeds are taking over the gardens). On top of that we spent three days last week traveling to and from the National Museum of the United States Air Force (a 9+ hr drive). And that doesn't include the almost 800 photos I've been editing and sorting! Oh, I’ve been responding to several research requests when I’m at my desk! So I’m not yet ready to write any topical articles, but I have been collecting links the past couple weeks. And I’m still trying to give away some books! So let’s take a look at some interesting items of edification as well as alerts for false teachers. An exegesis of John 1:1 proving the Jehovah’s Witness translation to be erroneous. A wee bit more on the subject. Great analogy about claims of visiting heaven. Some excellent questions to ask Seventh-day Adventists so as to reach them with the truth. Is your church Christian or “Christianish”? Thabiti Anyabwile has preached a lot of social gospel nonsense, but The Gospel Coalition seems to think he’s a wonderful teacher. I like Seth Dunn’s response to “Anyabwile’s” apology to Beth Moore. No, Jesus was NOT married to Mary Magdalene. What is grace? Many Christians don’t understand it, but cults have no clue. An apparent contradiction explained: the cattle of Exodus 9 and 11. A word about criticism from anonymous sources. Another response to Beth Moore’s whining, narcissistic “A Letter to My Brothers." An example of all that is wrong with Bethel Redding. Steven Furtick just keeps getting worse. This is flippant blasphemy. More proof that the Episcopal church is totally apostate. Another good article about this incident, demonstrating even more apostasy at that assembly. Take a look at this video promoting the event. Six reasons to stop listening to Joyce Meyer. Actually, you only need one reason — she is a rank heretic. Rachel Held Evans just can’t go far enough to demonstrate her hatred for God and Christianity. I keep saying to stay away from Tim Keller and his teachings. Andy Stanley continues to prove he is not fit to be a pastor. 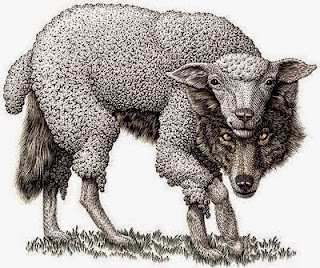 Here is another unbelieving wolf from the apostate PCUSA denomination. Mark and avoid him. Believe it or not, this is actually pretty much the way many KJV Onlyers think! Multiple translations don’t make a text more or less reliable. But it’s interesting that there’s kind of an underlying assumption when people make that statement and it feels something like this: “well, the Bible has been translated and once it got translated, people have revised the translation without going back to look at those early manuscripts.” And so, I thought that when I was in junior high school but I got past that relatively early. The reality is that the King James Bible, when it was translated in 1611, it was essentially based on seven Greek New Testament manuscripts, the earliest of which went back to the 11th century. We still have those manuscripts and we have almost 6,000 more manuscripts. So, we have almost a thousand times as many manuscripts as the King James New Testament was based on and our earliest don’t go back to the 11th century but so far as what’s been published, they go back to the second century. So they go back almost a thousand years earlier. So as time goes on, we’re not actually getting farther and farther away from the original text, we’re getting closer and closer. The apostasy is just getting worse by the day, as too many places in Scripture predict. There are a lot of teachers, teachings, and groups which need to be marked and avoided. This post will link to articles of exposing some of the worst — worst because they are sucking in too many non-discerning people. Jennifer LeClaire proves how hypocritical false teachers can be. Proof that followers of Benny Hinn are biblically ignorant and are nothing more than a cult. The Pope’s false and demonic teachings. He also needs to mind his own business and quit preaching gun-control. You know a song has to be bad for Christianity Today Astray to pan it. Dangerous false teachers seem to multiply on a daily basis to where I can’t keep up with who’s who! I just learned of a new whack-a-doodle this week, Ryan LeStrange. Avoid him like the plague. Andy Stanley continues to prove why he is not qualified to be a pastor. The Episcopal Church continues their spiral to hell. Beth Moore whines about her treatment by men, but it appears to me it is not about misogyny as she claims, rather, those who snub her are probably sick of her false teachings and putting herself up as a “leader in the conservative Evangelical world.” She is not only a false teacher, but she continues to put herself in a position of teaching authority over men. Perhaps she feels all her “direct revelations from God” allows her to disregard what the Bible actually teaches. This response to her is right on track. Joel Osteen would probably do this! Three incidents recently have led me to write this post. First, I was accused of being “self-righteous” for exposing David Jeremiah’s support of false teachers. Secondly, I was told I lacked compassion when I pointed out a problem with Hillsong’s “Oceans.” Thirdly, I was told that it is charging “guilt by association” to point out a teacher’s error of promoting false teachers. Let me make this perfectly clear: It is not lacking compassion, nor is it self-righteousness, nor is it “heresy hunting,” etc, to expose false teachings and false teachers. It is what every single Christian should be doing. It’s called DISCERNMENT. No matter how minor the false teaching may be, it must not be glossed over. We cannot tolerate even the most minor false teaching because “A little yeast works through the whole batch of dough.” A glass of lemonade with a couple drops of cyanide may taste sweet, but it is deadly nevertheless. 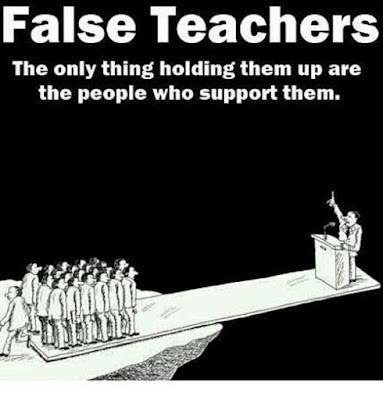 Tolerating false teaching ends up hurting people spiritually as well as emotionally, and leads them astray deeper into even worse false teaching. I’ve been told, “That’s just your opinion” when perspicuous truth is proven from Scripture; No, it’s not my opinion! I’ve been told that “God is compassion” or “God is Love” but they forget that God is also TRUTH. I’ve been told that emotion-driving songs from Hillsong, Bethel Redding, Elevation Church, et al, give the person comfort. I’m sorry, but there is absolutely NO excuse for not seeking comfort from the Lord and His WORD rather than from emotion-driving songs full of false teaching from places rife with heresy. Let me give an example of what is NOT claiming guilt by association: Matt Chandler. Chandler has praised false teacher Ann Voskamp. His church has promoted LEFTIST, Femi-nazi, pro-abortion Karen Swallow Prior. He has also praised false teacher Beth Moore. Promoting such teachers is going against the Christian faith, and until he recants his support for these people, he should not be given an audience. Let me give another example of what is not claiming guilt by association: David Jeremiah. He has promoted the contemplative movement, and he has favorably cited false teachers Phillip Yancey, Watchman nee, Henri Nouwen, Beth Moore, Eugene Peterson, Sarah Young and Erwin McManus, and he regularly promotes Word of Faith heretic Paul Crouch. (He is also guilty of association with by consistently appearing with many Word of Faith heretics, which is indeed promotion of them.) He promotes way more false teachers than does Matt Chandler and, again, he should not be given any sort of audience until he repents and recants promoting false teachers. Do you think Jesus, or Paul, or any apostle would have countenanced even minor errors without rebuking and correcting them? Absolutely not. So don’t shoot the messenger; listen to the truth the messenger brings and act on it. 6 Things We Need to Know about the Formation of the Bible. I don’t have enough faith to be an atheist. Even with their non-scientific ideologies, they need more faith for their beliefs than a Christian ever would need. Why Christians shouldn’t cuss. I also addressed this topic before. Refuting Paul Young’s false teaching in his book, Lies We Believe About God. Is the KJV Only position correct in maintaining that the doxology in Matthew 6:13 is original? What about John 7:52-8:11? Short answer to both: NO. The myth of 33,000 denominations. The Jesus of the Seventh-day Adventists is not the Jesus of the Bible. God has something to say about the way we approach worship. Freemasonry is indeed a religion. 9:47-minute video. Paul was indeed married, as this article thoroughly examines. I agree with this article when it comes to biblical reasons for divorce. The Word of Faith teachings are heretical and spiritually dangerous. One of the more popular songs invading churches during worship is Hillsong’s Oceans. The trouble with this song, as with so many, it that there are some good (well, okay) lyrics which become subtly undermined by what is becoming known as “theo-eroticism” (i.e., “Jesus/God is my boyfriend/lover” theology). That is what we have with this song. Unlike the way I normally do citations in blue, I’m going to leave this one without colors except for the theo-eroticism (red) and the obligatory mindless repetition (blue). Neither Jesus nor God are YOURS. That is the big problem with this song. I understand poetic ideas of being in God’s embrace, but when they add in “I am Yours and You are mine” it now sounds like you are talking to a lover. I realize this is a minor issue, but remember, “A little yeast works through the whole batch of dough.” People who listen to this song and find succor in it really need to realize that they should never place emotions about truth. We should NEVER use Hillsong material either for congregational worship or even private listening because Hillsong is the home of false teaching. If you need an explanation as to why it is necessary to avoid ALL of Hillsong material, I suggest you read my article here.